A level is a level is a level – not true! Selection of Box Beam levels . 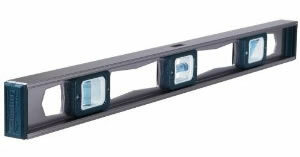 One of the first considerations is whether to buy a Box Beam, as shown in Figure 1, or an I-Beam level, as shown in Figure 2. Selection of I-Beam levels . Most level manufacturers have different grades of levels. If we use Irwin Tools as an example, they have two lines of box beam levels - the 2500 series and the 2000 series. 2500 series is made for tradesmen such as framers – people who use their levels daily and the levels are subject to lots of job site abuse. 2000 series is also made for daily use, but for trades such as professional carpenters where the work environment is not as abusive for the tool. Selection of wood mason's levels . What do you get when you pay more for a level? 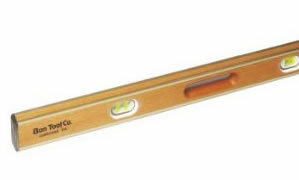 An I-Beam level is well suited for small projects, and most home handyman applications. They are not designed for heavy users, tough environments. What role does the length of the level play in determining what level to choose? The length of the level you should buy depends on the project being undertaken. If work is being done on wall where there are high ceilings, a longer level is better. You want the level to reach across a meaningful section of the surface being leveled or plumbed. Portability is also a criteria. It is much more difficult to take a long level into a crawl space, so short or mid length levels may be better for this type of work. Aluminum – durability is determined by the thickness and type of the aluminum and also the geometry of the cross section of the aluminum box construction. Wood – mason’s levels are often made of wood, as shown in Figure 3. Some of this is driven by tradition, but masons also find that the mortar cleans off of the wood more easily. Plastic – Plastic levels are easy to clean and carry. Plastic is a good material where accuracy is less important; for example, when doing rough landscaping work such as building a sandbox. Plastic levels generally have a shorter working life than aluminum levels. Make sure they are not bearing any weight where they are stored. If they are in the back of a truck make sure other items are not resting on top of them. 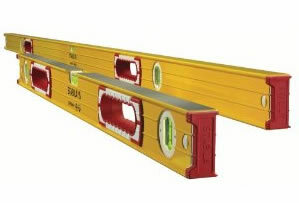 Do not lean them against walls, as the level will over time sag – especially I-Beam levels. Do not store them in direct sunlight. The green liquid in the vials may fade, and the temperature changes may compromise the accuracy of the level over the longer term. We wish to thank Irwin Tools for their assistance in writing this article.